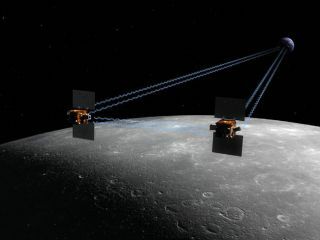 The Gravity Recovery and Interior Laboratory, or Grail, mission will fly twin spacecraft in tandem orbits around the moon to measure its gravity field in unprecedented detail. No matter how exciting your plans are for New Year's, two NASA spacecraft have you beat — they've got a date with the moon. After more than three months of spaceflight, NASA's twin Grail probes are set to start orbiting the moon this weekend, with Grail-A arriving Saturday (Dec. 31) and Grail-B following on Sunday (Jan. 1). The spacecraft are on a mission to map lunar gravity in unprecedented detail, shedding light on the moon's composition, formation and evolution. "Our team may not get to partake in a traditional New Year's celebration, but I expect seeing our two spacecraft safely in lunar orbit should give us all the excitement and feeling of euphoria anyone in this line of work would ever need," said Grail project manager David Lehman, of NASA's Jet Propulsion Laboratory in Pasadena, Calif., in a statement. The $496 million Grail mission (short for Gravity Recovery And Interior Laboratory) launched on Sept. 10 and took a circuitous, and energy-efficient, route to the moon. Earth's nearest neighbor is just 240,000 miles (386,000 kilometers) away, but the two spacecraft will have put about 2.5 million miles (4 million km) on their odometers when they finally arrive. The long journey has given the mission team plenty of time to assess the probes' health and to power up their science gear, researchers said. Both spacecraft will make their orbital-insertion maneuvers automatically. Still, about 40 members of the Grail team will be monitoring the action over the weekend to make sure everything goes according to plan — and to jump in if it doesn't, Lehman told reporters Wednesday (Dec. 28). Orbital insertion is a nerve-wracking part of any space mission, and Grail gives scientists and engineers twice as much to worry about. "The anxiety level is heightened right now, and it is more so than with other missions, because we do have two spacecraft to go into lunar orbit," Lehman said. "But we've been studying and working on this for three or four years — four years — and we're well-prepared for that." The fact that Grail-B will arrive about 24 hours after Grail-A should help streamline the process and calm some nerves. "The team will have time to rest between each event," Lehman said. Grail-A and Grail-B will chase each other around the moon for 82 days, staying 75 to 225 miles (121 to 362 km) apart. Regional differences in the moon's gravity will cause the two spacecraft to speed up or slow down slightly, changing the distance between them as they fly. Using microwave signals that they bounce back and forth to each other, Grail-A and Grail-B will gauge these distance variations constantly — and with incredible precision. The Grail probes will be able to determine how far apart they are to within a few microns, less than the width of a human red blood cell, researchers have said. Scientists will use the twin probes' measurements to construct extremely accurate maps of the lunar gravity field. These maps, in turn, should reveal the moon's structure in great detail, allowing scientists to draw insights about how the rocky body formed and how it has changed over time. So the Grail team is hoping that the two spacecraft's arrival at the moon heralds many exciting discoveries to come in 2012. Having "a great set of technological accomplishments, I think, is a great way both to end the year and start the new year," said Grail principal investigator Maria Zuber, of the Massachusetts Institute of Technology.